That is, a quick update about running. I haven’t got much time for the rambling or the nonsense or the, well, blogging in general today, but there’s this thing that I wanted to mention to everyone before the weekend. This morning, Friday, at the sometime shortly after proctology o’clock, I ran five kilometers. Consecutively. Using my feet. Without falling down. Or dying. See, that’s, like, the “5K” part of running a 5k (for you curmudgeonly English-unit of measurement types out there who “didn’t fight for this country’s independence just so we could have idiot European metres and whatnot” that’s 3.1 miles). Don’t believe me? GPS don’t lie, my friend. Am I perhaps a little overly excited about this accomplishment since, strictly speaking, I’ve run three miles before today as part of the Couch-to-5K program? Well, yes, but today was the last run of the program for me. And I tacked on just enough to get me to that 5K mark because, well, that’s the kind of nit-picking rule-follower I am. But anyway, ANYWAY! The point here is that I did it. I started off in my recliner with a pint of Imperial stout and a general tendency towards sloth and have now, officially, run further than ever before in my life. No photo credit; these are my actual shoes. Spiffy, huh? 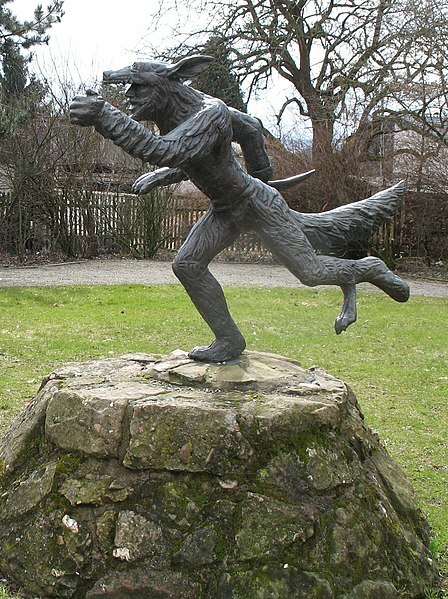 Err, that is, I mean that statue guy is running, not that he’s some kind of wolf/coyote hybrid monster. I mean, it might have been cool when I was younger, but I’m not currently a werewolf to the best of my knowledge, nor do I really plan on becoming one. Anyway, the point is that, I set a goal for myself and then took little steps to get it accomplished. And if I can do it, I’d bet every dollar* I’ve got that you can too. *Trust me, that sounds like a lot more impressive a wager than it is. The Puddinette keeps all my cash. I tend to be, um, untrustworthy with it.